Lead poisoning, air pollution and exposure to violent crime are all things that can negatively affect the health and well-being of children. Unfortunately, social and environmental stressors like these don't occur in isolation. Particularly in poor urban communities, such exposures – from the water children drink to the structures they live in – are a complex fabric of experiences that isn't well understood. At Colorado State University, a multidisciplinary research team is taking a deep dive on a multitude of environmental and social stressors, and how they affect health outcomes for young children. The researchers are supported by a three-year, $600,000 grant from the Environmental Protection Agency. Lead researcher Sheryl Magzamen is an assistant professor of environmental and radiological health sciences in the College of Veterinary Medicine and Biomedical Sciences. She is an epidemiologist who previously studied lead exposure in vulnerable communities in southeastern Wisconsin, while completing postdoctoral work at the University of Wisconsin-Madison. For the EPA project, she will work with the same state of Wisconsin colleagues for access to data on local populations. "In epidemiology, we tend to focus on one thing, whether that's lead, or air pollution," Magzamen said. "The question is, what if you have all of these? Does it make you so many times worse off than children who only have one or a certain combination of exposures? … These exposures, they travel together. It's not just lead. It's also the built environment, air quality, poverty and other social determinants of health." The EPA project will comprise a multi-factor, retrospective analysis of about 17,000 children in Milwaukee and Racine counties in southeastern Wisconsin. The studied populations will include children in Wisconsin's lead tracking database; Women, Infants and Children (WIC) enrollment data; and Medicaid claims data. The demographic profile of these groups is generally low-income and primarily non-white. The researchers' goal is to develop new exposure models that reflect the children's chemical, social and physical environments. Their models will highlight how such exposures influence health outcomes from children's prenatal period through the age of 4. They will estimate the causal effect of "total environment" exposures. Magzamen will be joined by experts in air pollution, housing quality, statistics and human development to complete the exposure models. All the CSU project collaborators are members of the Partnership for Air Quality, Climate and Health (PACH), established by the Office of the Vice President for Research. PACH conducts transdisciplinary work on specific problems related to air quality. Topics they study include wildfire smoke, motor vehicle emissions and ozone. Working with Magazmen on the EPA grant is Ander Wilson, assistant professor in the Department of Statistics and an expert in environmental statistics. He specializes in developing novel methods and data science tools to learn how environmental factors influence human health. His role in the project will be to develop an overall statistical framework for the effort. "There are a lot of very interesting and challenging statistical questions to address in these data," Wilson said. "That excites me as a statistician. It is an opportunity to think creatively as we analyze the data." Another collaborator is Shantanu Jathar, assistant professor in the Department of Mechanical Engineering and a member of the CSU Energy Institute. Jathar is an expert in air quality modeling. His role will be to provide high-resolution (down to 1 kilometer) air quality estimates of pollution in the Wisconsin study area. The team will look at all exposures – including bad air — and their links to health outcomes. "What's exciting about this project is to see in action – for the first time for me – how air pollution data actually helps people who work with health data, and to examine these pollutant-to-outcome pathways," Jathar said. "Despite being an air pollution scientist, I have never had the opportunity, prior to this, to work with epidemiologists." 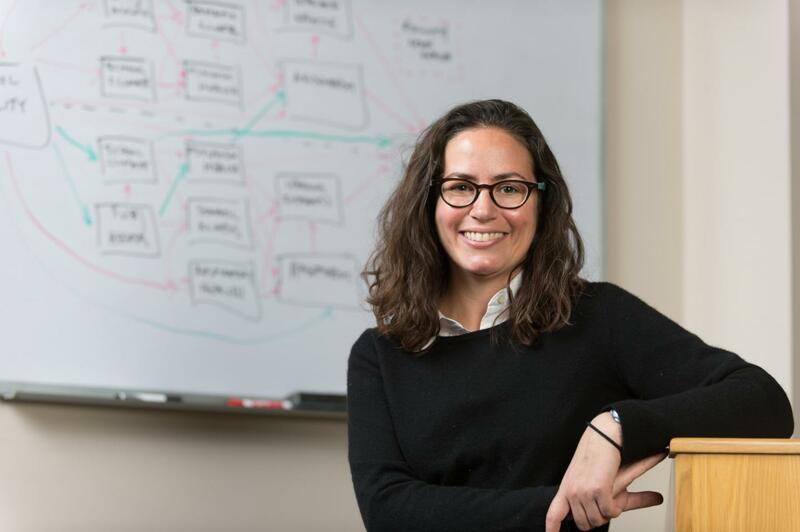 Ellison Carter, assistant professor in the Department of Civil and Environmental Engineering, studies air quality and air pollution exposure, with a focus on the role of built environments and housing. She will lead the EPA team effort on answering how the study subjects' built environments relate to other exposures, and how they affect health. Also joining the research team will be Janean Dilworth-Bart of the University of Wisconsin, a professor in human development and family studies, who will act as a senior consultant for the team.